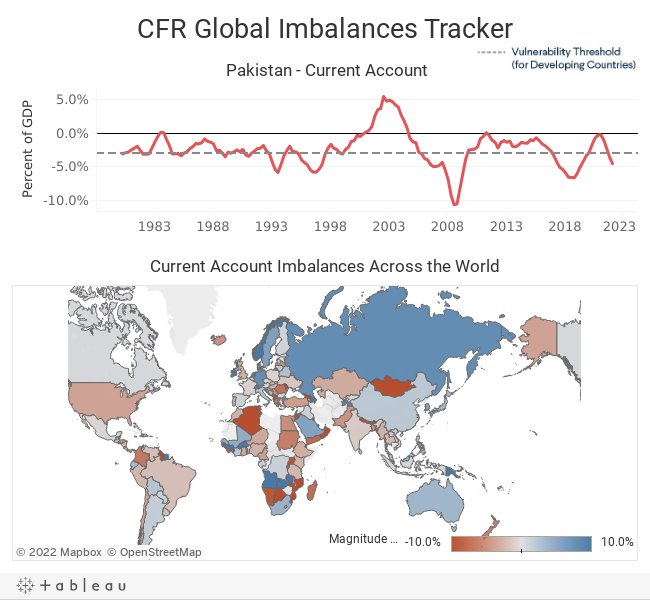 The CFR Global Imbalances Tracker can be used to gauge, through time, the vulnerability of individual countries and the global economy to the buildup of imbalances in the current account (of which trade deficits or surpluses are the largest component). Below, the Global Imbalances Index shows the total size of global current account deficits and surpluses as a percentage of world output. As can be clearly seen, the Index peaks just as the 2008 financial crisis unfurls. Horizontal lines highlight the historically high levels of imbalances in the run-up. Many factors drove the surge in imbalances, with central-bank dollar reserve accumulation in Asia and consumption growth in the United States figuring prominently. Rising imbalances funneled savings into deficit countries, such as the United States. The resulting decline in interest rates fueled borrowing to purchase risky assets. When U.S. house prices began falling in 2007, overleveraged borrowers triggered a cascade of defaults that plunged the economy into recession. Imbalances thereafter receded with, among other things, falling oil prices and rising Chinese domestic investment. For developing countries, which typically do much of their trade and debt issuance in U.S. dollars, large current account deficits leave them vulnerable to “sudden stops”—reversals in capital flows from inward to outward. These can damage economies by forcing up inflation, interest rates, and debt-service costs. In episodes such as the 2013 “taper tantrum,” in which fears of U.S. Federal Reserve tightening triggered such reversals, developing countries with current account deficits above 3 percent, such as India, Indonesia, and Turkey, were particularly hard hit. That threshold is indicated for developing countries as a horizontal line on the chart above the map. Please also see our Sovereign Risk Tracker, Global Monetary Policy Tracker, and Central Bank Currency Swaps Tracker. 1. The total value of countries’ current account surpluses should, in theory, equal the total value of deficits. However, a lack of up-to-date data for some countries during the periods shown, as well as inconsistencies in countries’ data-reporting practices, cause the absolute values of surpluses and deficits to differ slightly. World output is calculated as the sum of GDPs of countries included in index data. 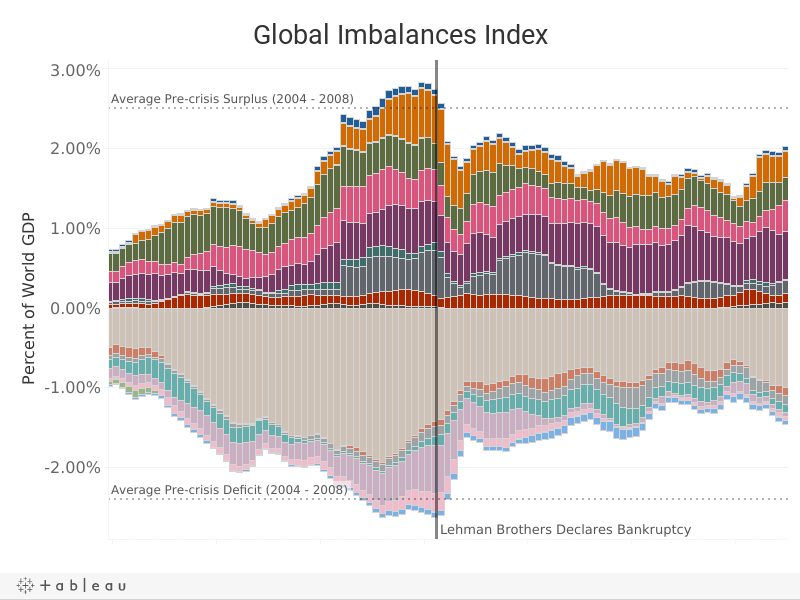 The Index calculates global imbalances by summing the surpluses and deficits for all countries individually, rather than aggregating countries by region and then summing each region’s surplus or deficit. 2. Current account data come from IMF balance of payments statistics. GDP data come from the IMF’s International Financial Statistics (IFS) dataset, except for hyper-inflating Venezuela after 2012, for Myanmar prior to 2013, and for cases in which the IFS has not yet published a country’s previous-year GDP. In these cases, GDP data come from the IMF’s World Economic Outlook. Balances are shown as a four-quarter rolling sum for countries for which quarterly data are available; otherwise data are annual.